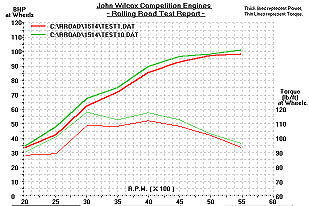 Rolling Road Testing, John Wilcox Competition Engines. 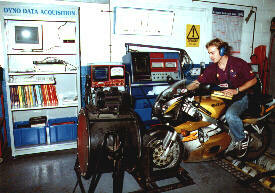 rolling road club days,power test. Housed in one side of the factory is our 375 Bhp rolling road, complete with Sun diagnostic equipment and our own data acquisition system which provides accurate power and torque curves with full temperature and barometric correction. As well as the dedicated test facilities, we also have a team of enthusiastic technicians with a wide knowledge, who are able to obtain the very best from your engine. From a std road to full-race spec. A correctly set up engine can only be achieved on a dynamometer, where we are able to optimise fuel and ignition settings for that particular engine. 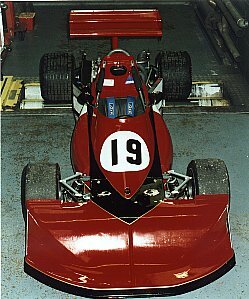 Our rolling road facility is used by Peugeot Sport for power tests and programming their engine management systems, Ram Air UK LTD, Induction Technology Group ( I T G ) for testing their air filter conversions, Ford Motor Company, Power Train Projects and Gibbs Technology for specialised testing. For many years the rolling road with its additional custom made fittings has enabled us to test various bikes for Triumph Motorcycles LTD. 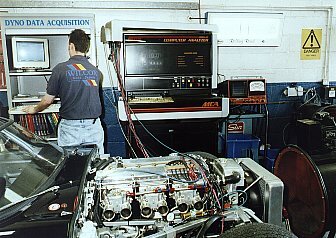 The customer receives a printed test sheet showing power, torque, CO and boost figures, A graph of power and torque shows exactly where and how much of an improvement has been gained on the rolling road. All files are stored so that we can deal more efficiently with a return visit. Having a rolling road has allowed us to develop and manufacture data acquisition system, suitable for Clayton and Sun rolling roads, and a Knock detection kit for use while testing engines. All systems are available, contact us for details.